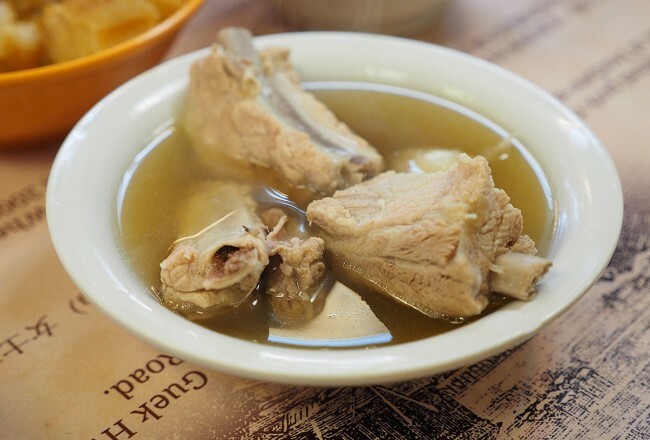 How can one simply improve a traditional hawker dish, taking a step further what our ancestors did? 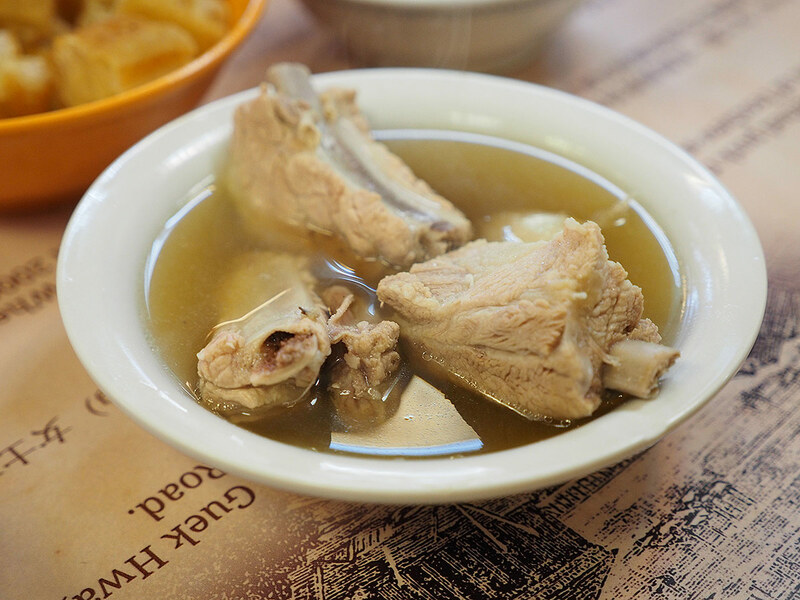 Of course, there are hotels serving high end chicken rice which costs $20+ per plate, prawn noodles, bak kut teh, etc. 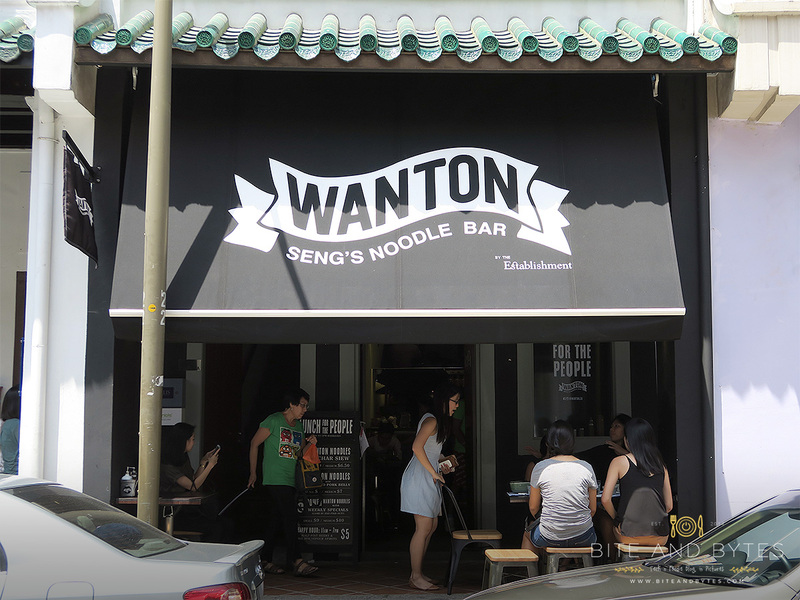 So what about quite a dish that barely makes into headlines of Singapore’s best food and must try — Wanton Noodles! 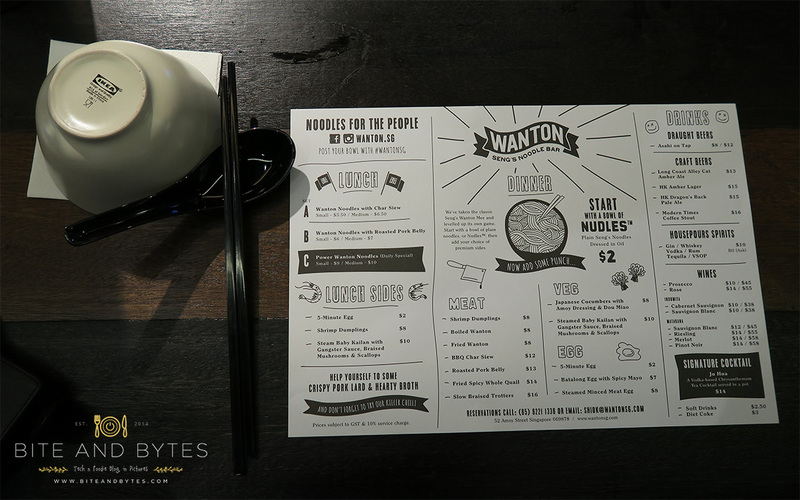 Was really excited to try this atas and hipster wanton noodle bar, and I must note that I haven’t tried the original Seng’s or Eng’s noodles at Dunman/Bedok before. We reached there at about 1PM+, and was informed beforehand that their noodles may just sell out before they close for split shift. 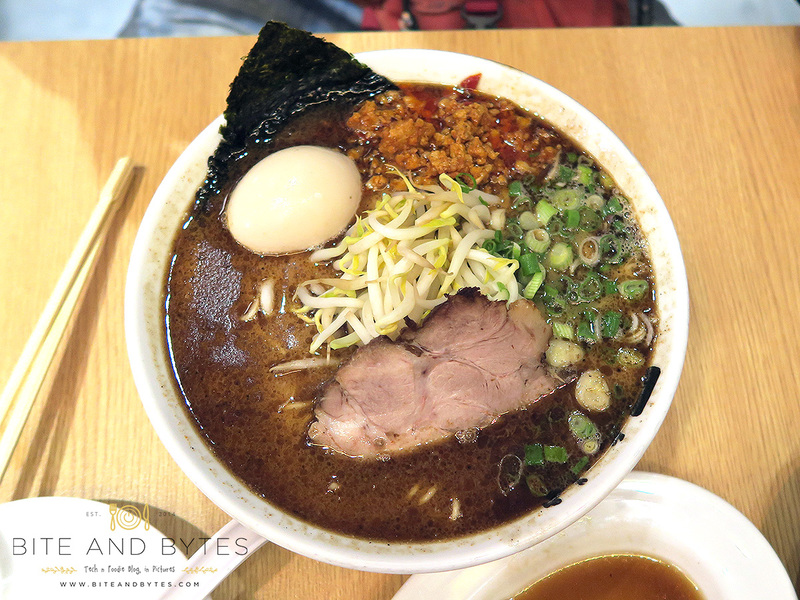 Luckily, we managed to get a place, and order our noodles. You would have to say the people who did their branding hit all the right hipster notes, with all the deco, typography, menu design. The service was pretty good too, with the restaurant managed by aspiring youngsters. The order system here is simple, decide what you like to have, go to the cashier and make your payment plus order. 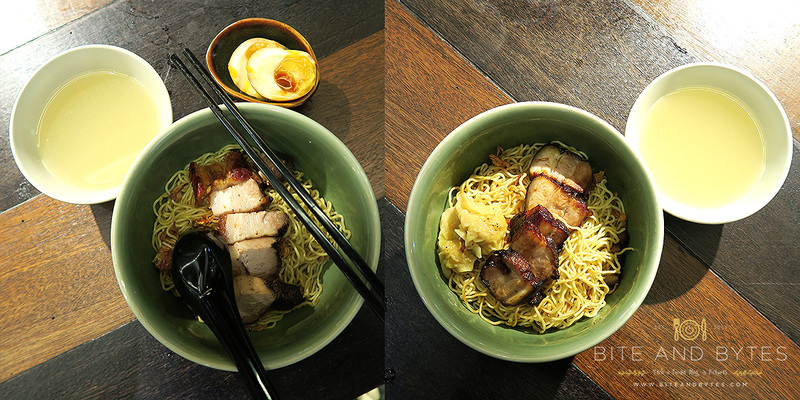 And we were only left with Choice A (Char Siew) and Choice B (Roasted Pork Belly). 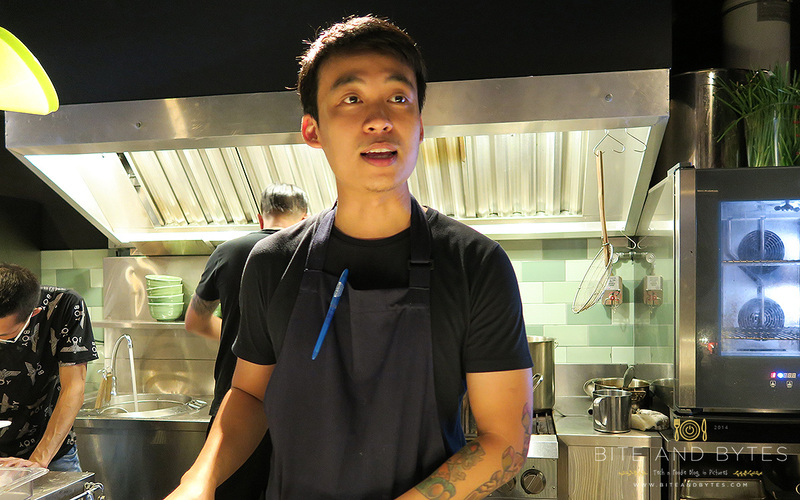 You might want to note that the 5-minute egg is a separate side order from the noodles, which brings us to a long story which I’ll leave to the end to explain. The soup broth is actually served on a thermal flask, which you pour into the IKEA bowl yourself, there’s also FREE refill if you want to. Condiments are also available on the tables, worth a mention is their crispy pork lard. 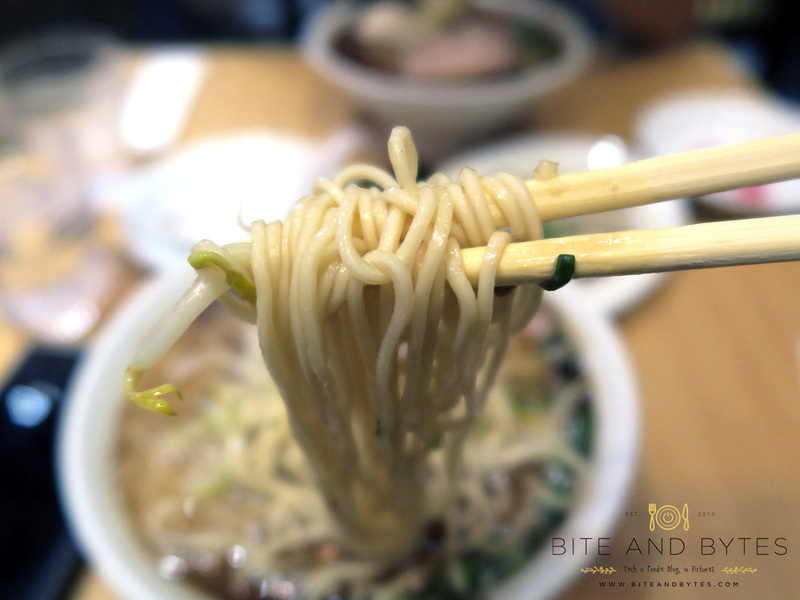 The noodles comes fairly quickly after a short wait, but just note that the wanton dumplings are usually hidden below the noodles. My order was the B set, roasted pork belly. 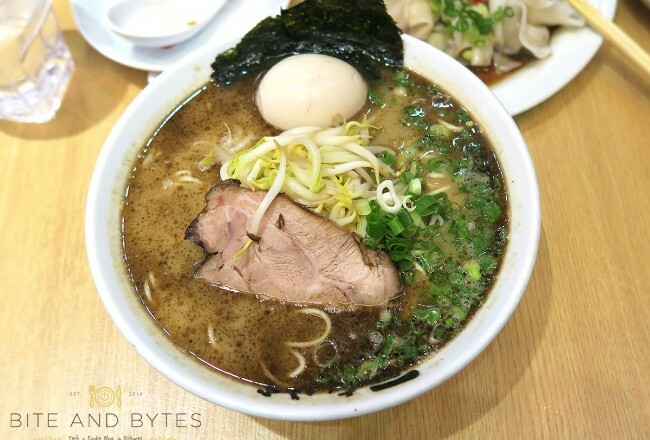 At first glance, it looks pretty dry, both the noodles and meat, and the meat was rather unevenly sized, though all were really chunky. It’s really quite a generous portion I must say. 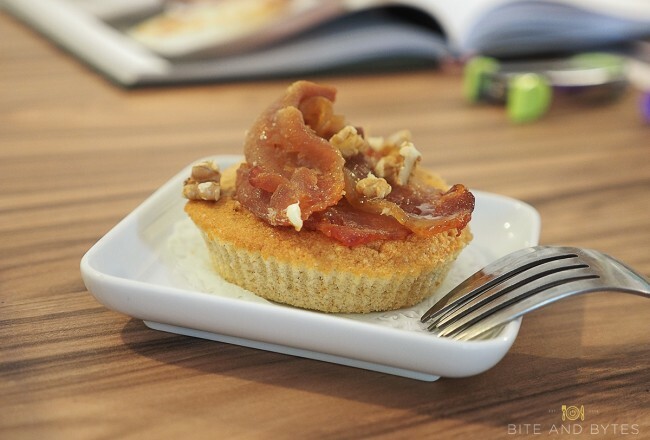 However, this chunkiness can lead to too much fatty taste on your palate, which my colleagues agreed upon too. The skin of the pork belly was really crispy, but the meat just lacked tenderness, and needed more flavouring for my taste. 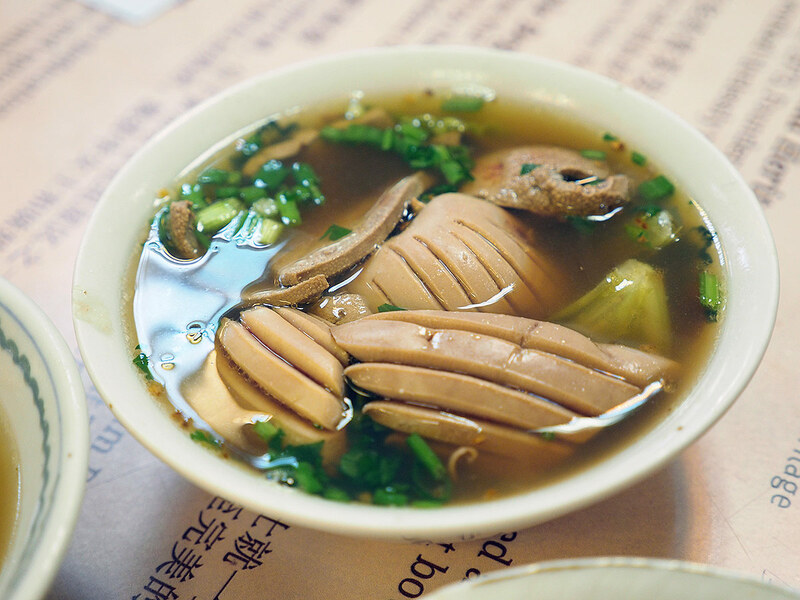 The broth was really sweet, which I guess they used a lot of soy beans to boil the soup, very different from the wanton noodles type of soup if you ask me. 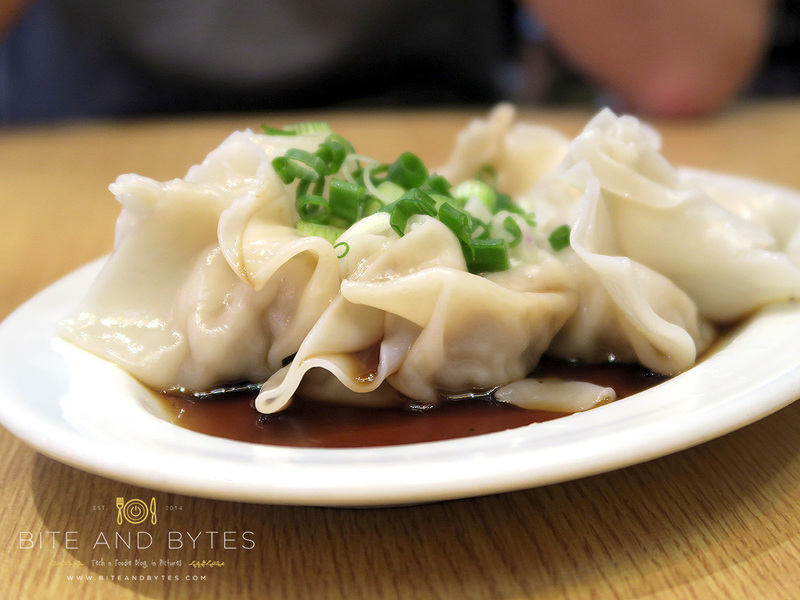 And wanton wise, has plenty of fillings. 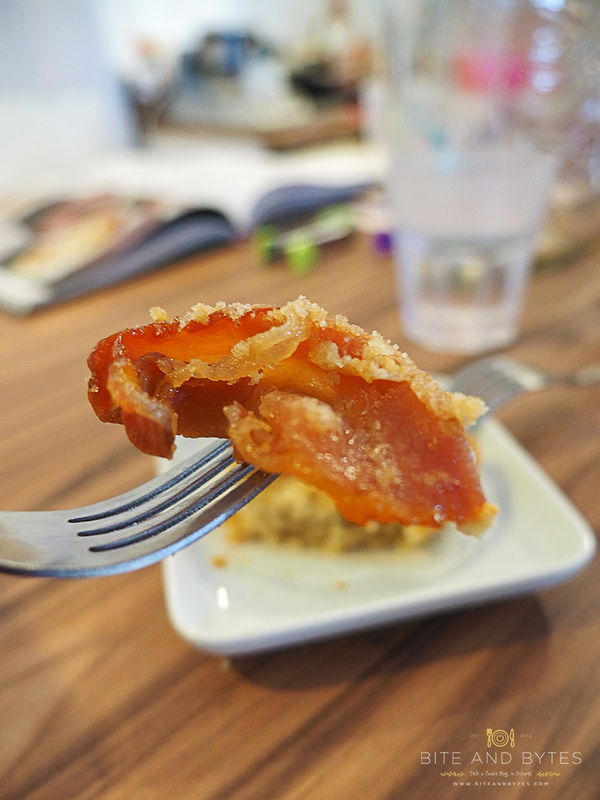 My colleague passed me a piece of char siew to try, which was also really chunky and generous. 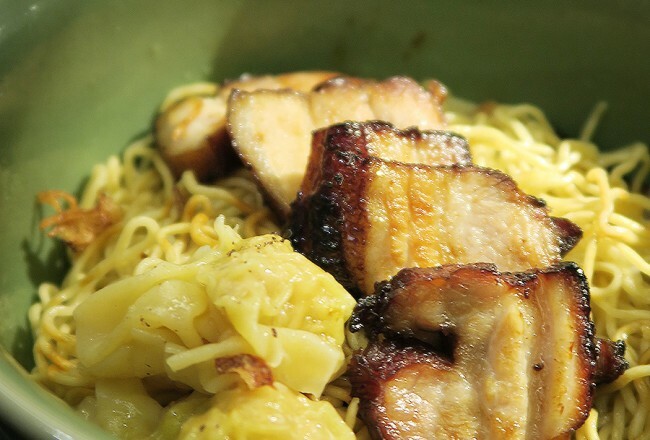 This char siew is really different from what you get on a normal plate of wanton noodles, it’s the fatty part (五花肉) , which was roasted nicely with a little ‘charred’ taste. 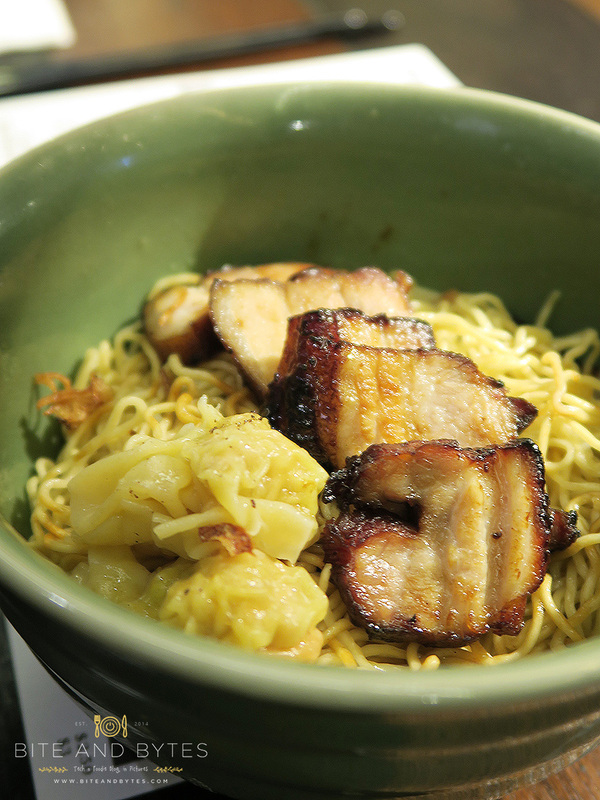 Still required more taste in the char siew for my liking, needed more caramelization for a sweeter taste. 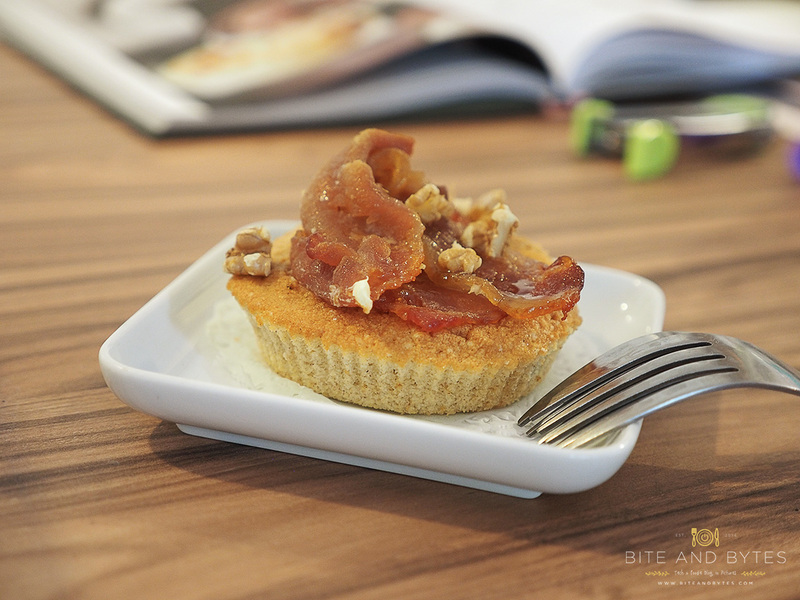 Having said that, I strongly recommend you to try the char siew version instead of the roasted pork belly. Noodles wise, it’s thin, a little springy, and has the egg noodles taste, not sure if it’s really handmade or from suppliers though. 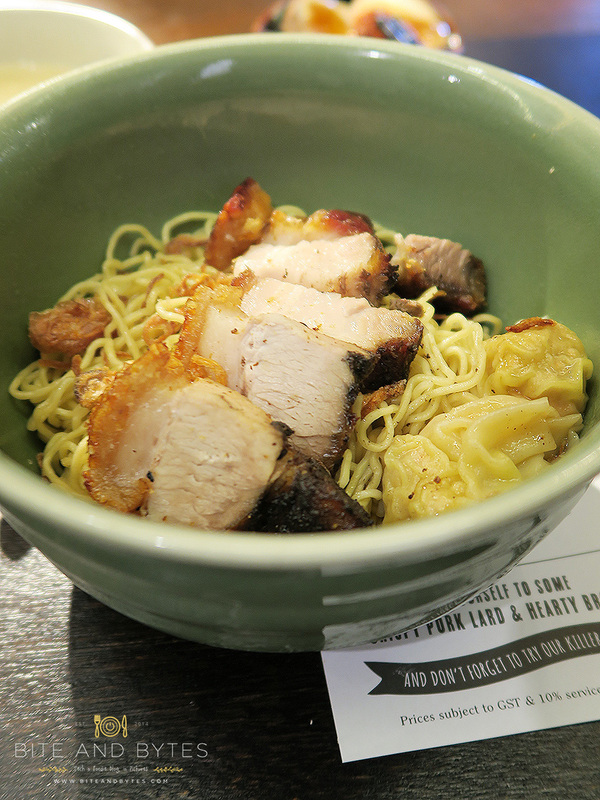 It tasted a little like the ‘kolo mee’ texture. For me, the noodles passed, but needed more gravy for that generous portion again. But of course, there’s their famous chilli to go along with the noodles. The chilli was supposed to be super-spicy from what I heard, but was milder than what I had expected. 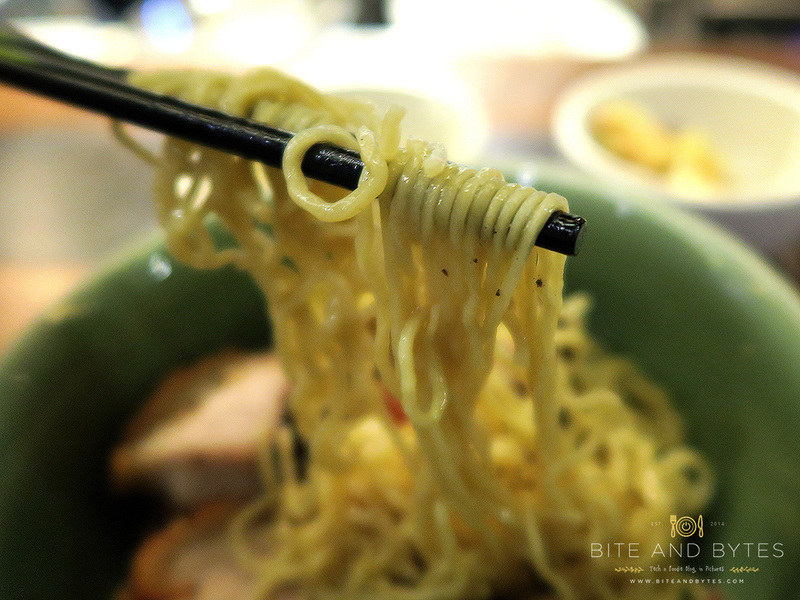 But certainly adding the chilli gives more shiok and dimension to the noodles (just that non-spicy lovers will be left out this way). 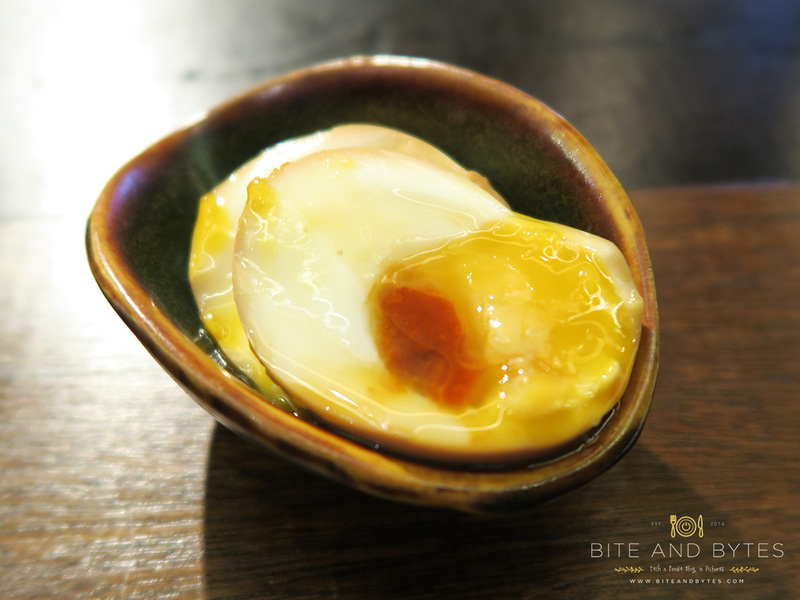 The 5-minute egg was one of the best part in the whole experience at Wanton. The egg was perfectly cooked, with no part of the yolk getting solidified. 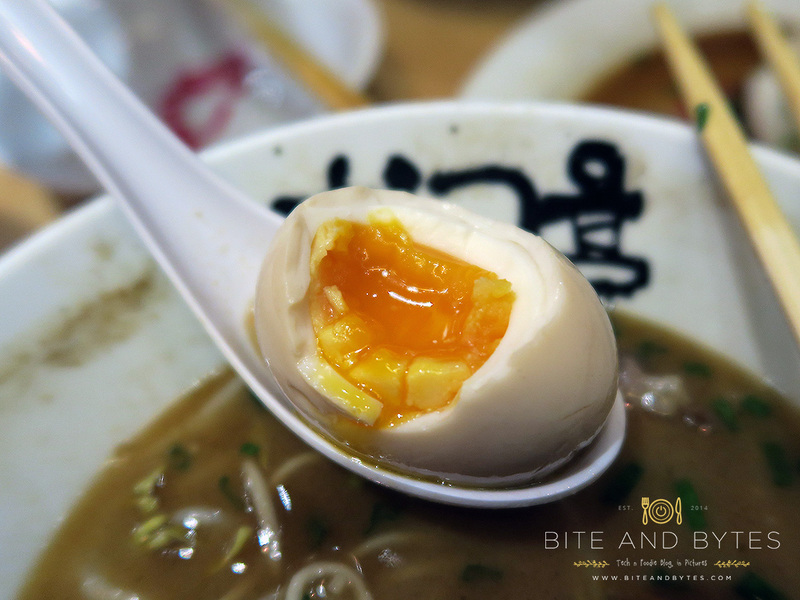 It was savoury with the shoyu or soya sauce taste, and one of the better eggs I’ve eaten for quite a while. 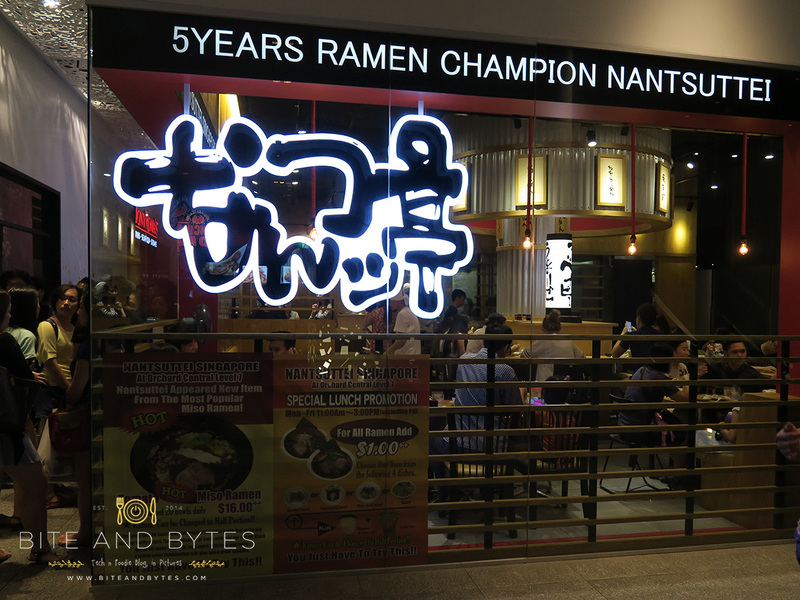 And to the 5-minute egg story — which we ordered at the cashier and later told that it’s sold out when our noodles were served. So a refund was obligingly given, and with some perks! The ‘towkay’ of the restaurant offered to make up for it, eventually reached to an agreement for an additional bowl of wanton. And after the agreement, came 3 plates of 5-minute egg! We weren’t sure where they got from, but yeah, we eventually managed to get some eggs on the house. 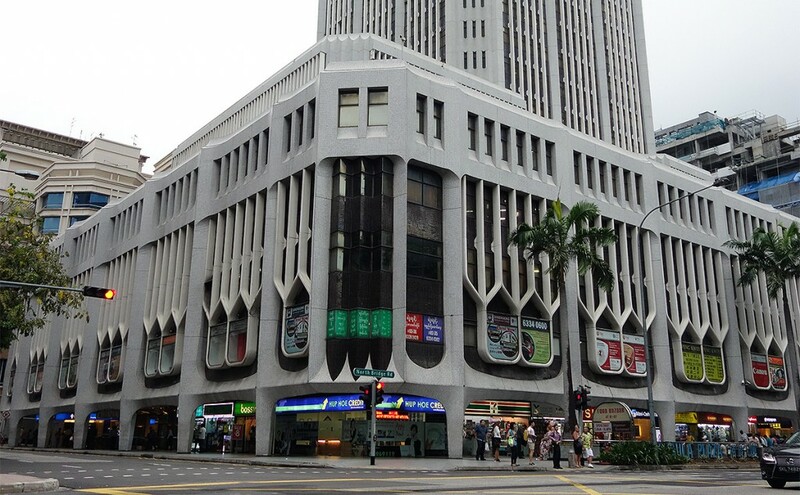 Really commendable service here, and as a Singaporean, Mr Kiasu would give a thumb of approval. Had a good chat with the ‘towkay’ after our meal, cause one of our colleagues know their fishing-kaki or something, so we found out they are still trying to get feedback from customers to make a better bowl of wanton. 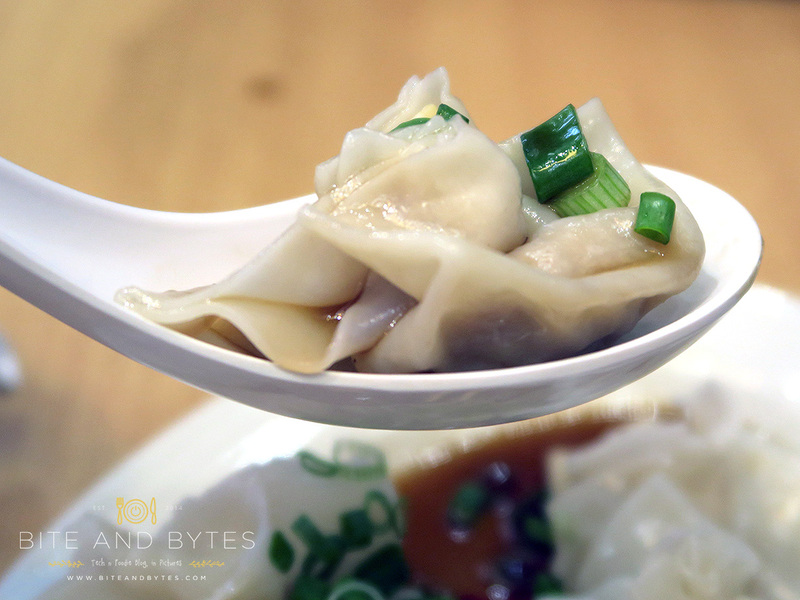 This experience at Wanton didn’t meet all the raves and expectations from this place. Actually I would suggest the pork belly to be braised instead of roasted, since they did the 5-minute egg, which is japanese style, so why not right? But after chatting with them, I guess they’ll be making improvements along the way, which I really hope they would. 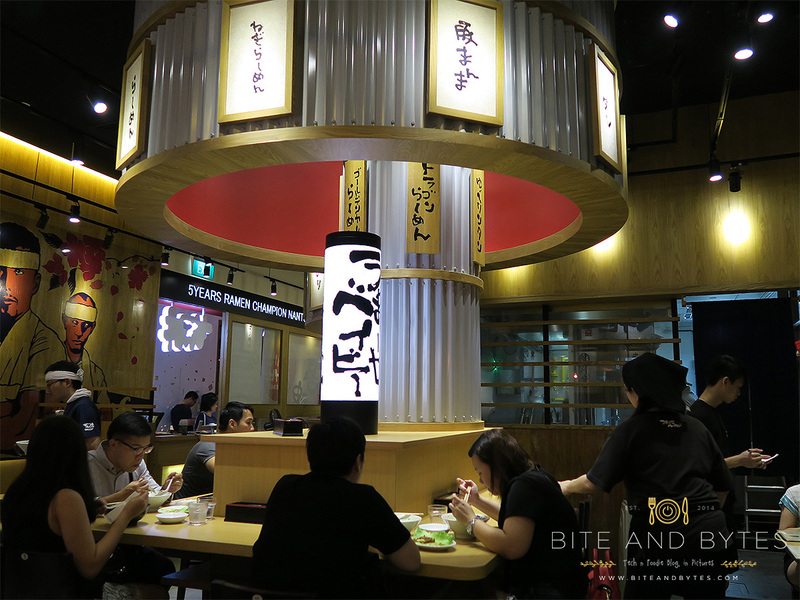 As Jurong East and Boon Lay have no lack of shopping centres, finding a restaurant to dine in is as easy as ABC, which might be a reason why cafes avoid Jurong area. 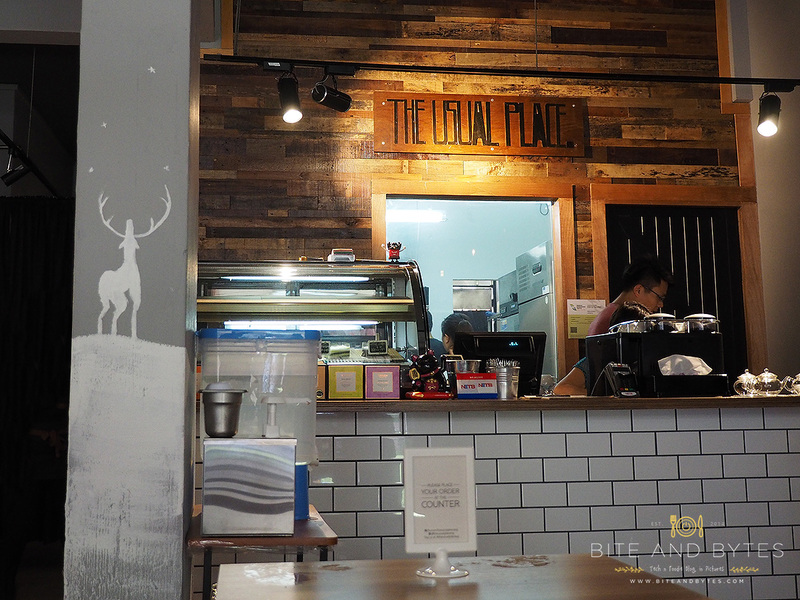 And just when I thought the area is highly lacking in cafes/bistros, Jurong East (Street 31) pops out one cafe which probably makes people living nearby really excited! “The Usual Place”, for Chinese it probably translates to 老地方, not to be confused with the vegetarian restaurant though. 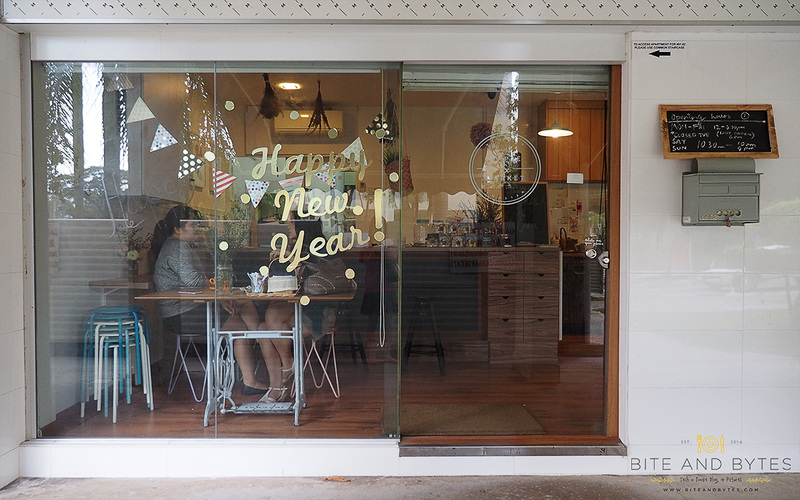 It’s opened by a group of youngsters who probably have hit the jackpot by opening the cafe there. We went around lunch time, 1pm+ and there was quite a crowd! Though we didn’t have to wait much for a seat, but if the business continues to bloom, I’m sure the stools outside will be put to good use. 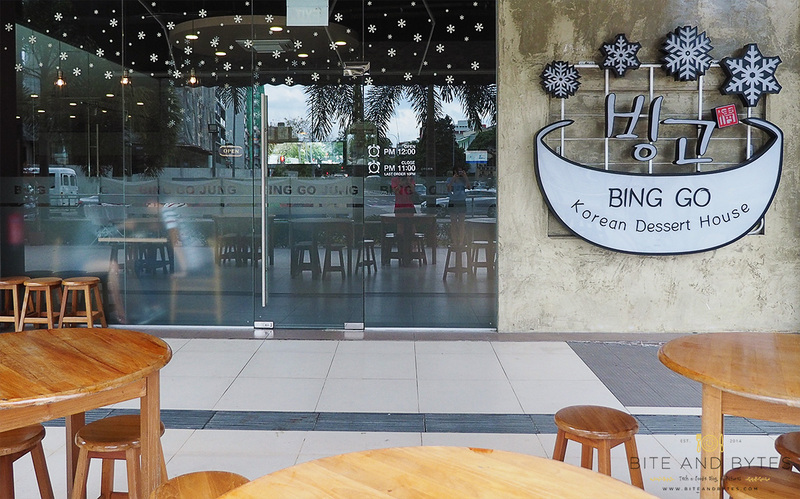 The place looks really comfy with dim lights, during the afternoon, the sun light shines through the glass windows. You are required to order through the counter after looking through their menu, free drinks and sauces are available nearby. If you could notice, tissue papers are also provided at the counter, so don’t hesitate to take one in case you need it later. 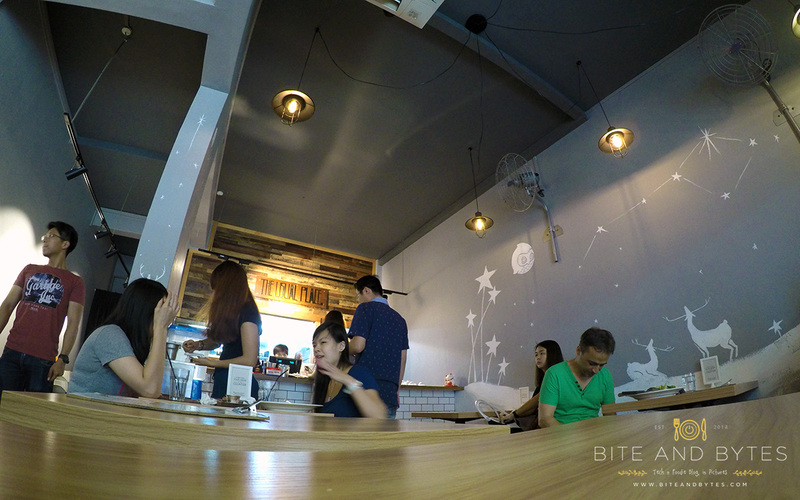 The walls are decorated with decals, tables are small, but ample enough to place 3-4 plates of food? 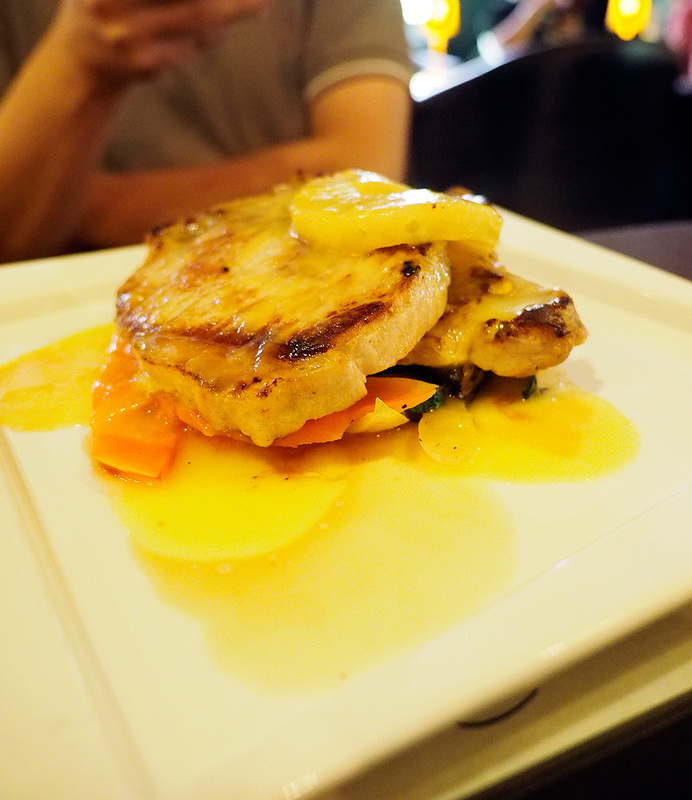 Next on the Chef’s recommendation list was what’s trending recently, everything with salted egg sauce, ta-dah! 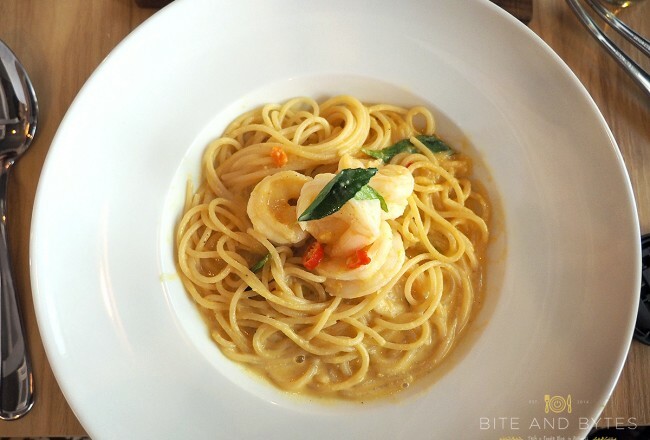 Salted Egg Prawn Pasta (S$12.90)! 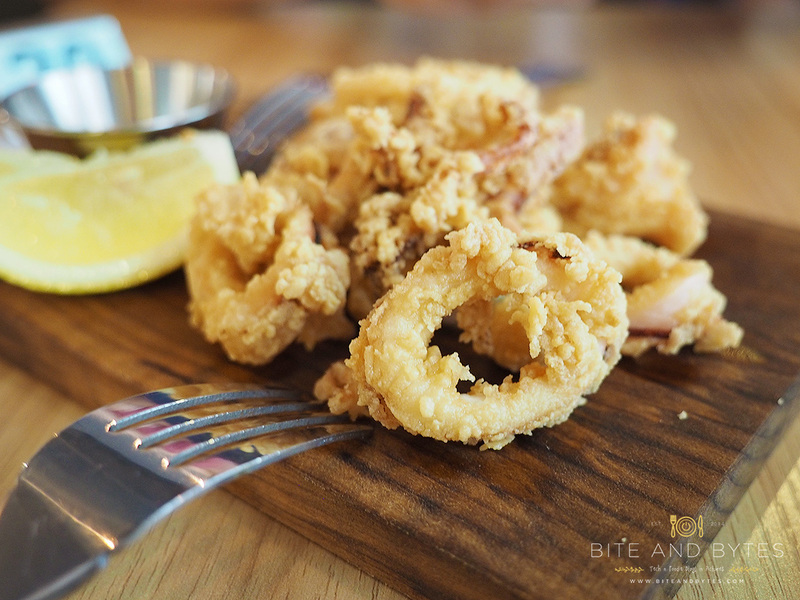 I first tried a similar rendition of this dish at Petite Menu @ Lavendar AQueen Hotel, which was using Soft Shell Crab with Sakura Ebi prawns (but since then their standard dropped). So I was excited to try this dish to see how it fares! First thing I noticed was the size of the prawns was pretty big and it’s all peeled (I hate peeling prawns). 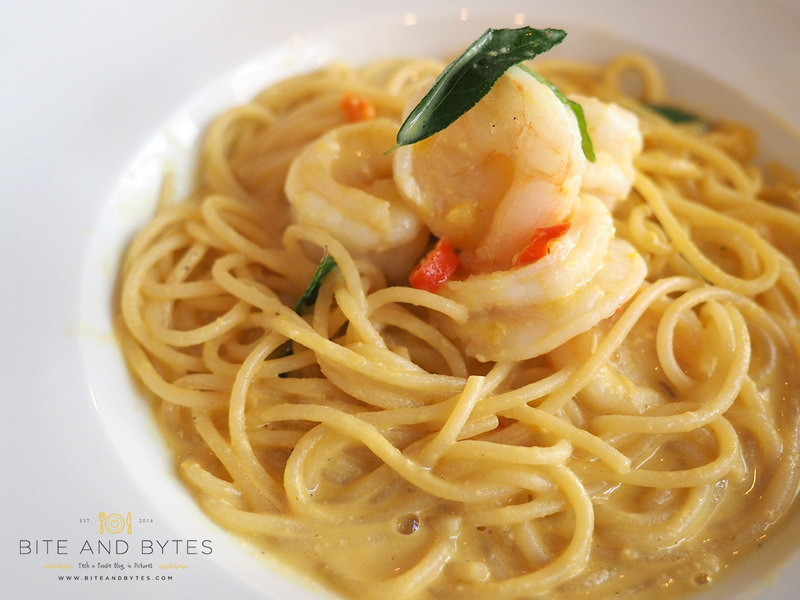 The aroma of the salted egg yolk makes me wanna try this dish straight away, haha. 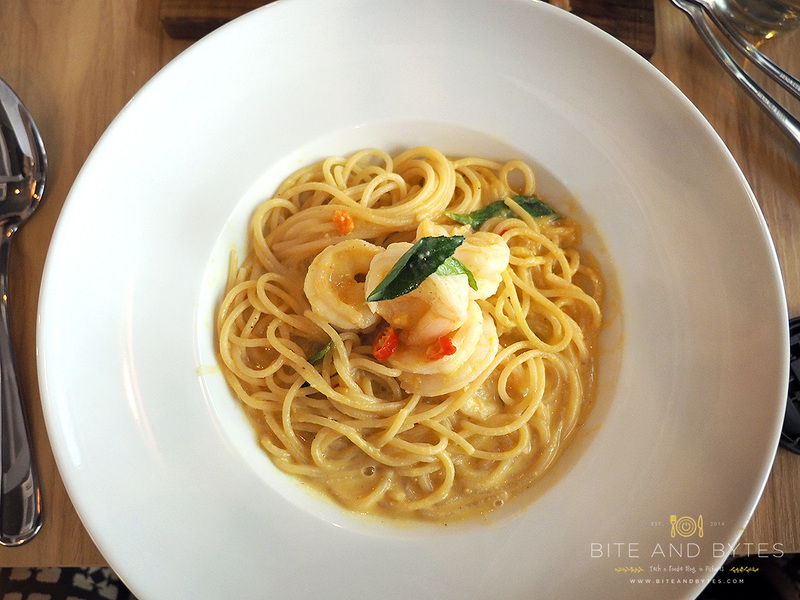 Anyway, the sauce was creamy and fragrant, compared to Petite Menu’s version, I felt the sauce could have been reduced a little more to make it thicker, so it sticks to the spaghetti better, this one’s creamier. 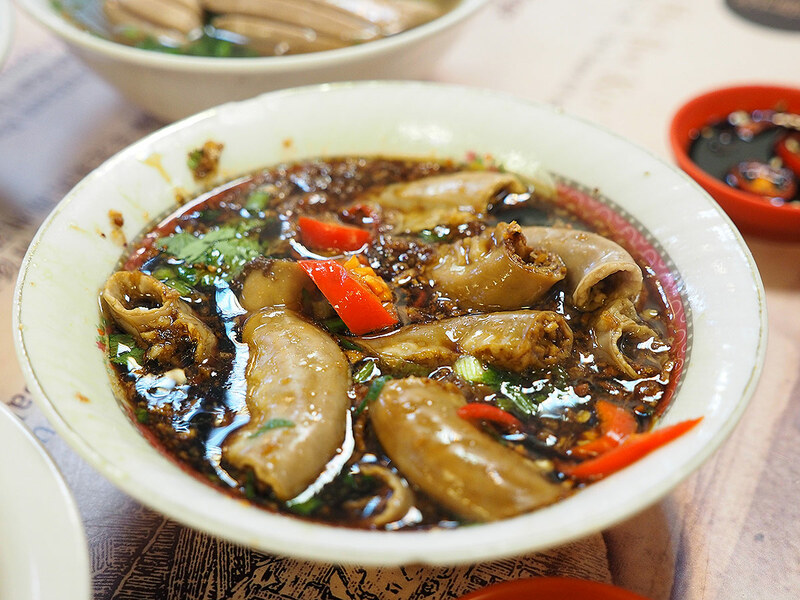 One thing to note, spicy lovers might notice the menu indicate this dish to be spicy, but there’s actually only a hint of spiciness in it, so don’t expect flaming levels here. Having said that, it also means everyone can take this dish, it’s not gonna burn your tongue or something. 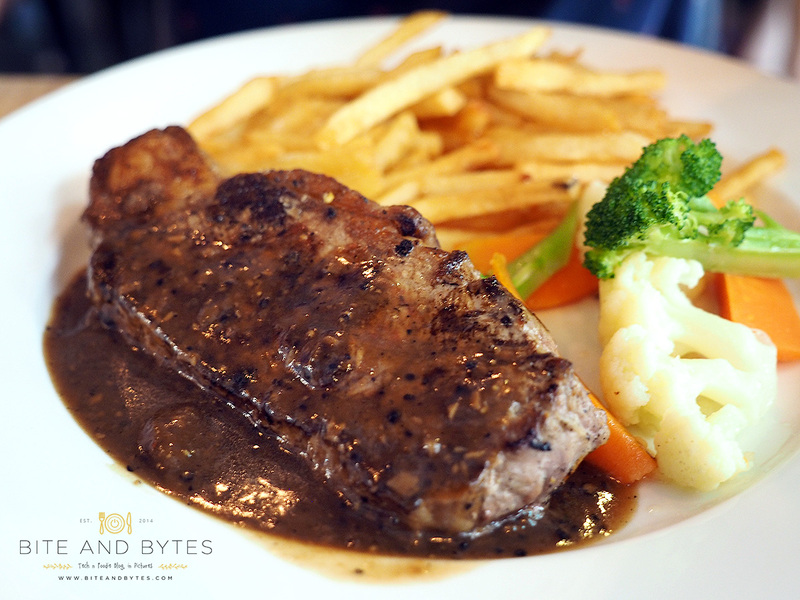 The next main course was their Prime Sirloin Steak (S$16.90), their priciest dish on the menu, yes, their most expensive dish doesn’t even set you back above S$20! My boyfriend estimates it to be around 180-200gm, so that’s quite a reasonable portion of steak for that price. Should you read on the menu that it comes with roasted potatoes, do note that they have since changed to french fries, seasonal vegetables remains. 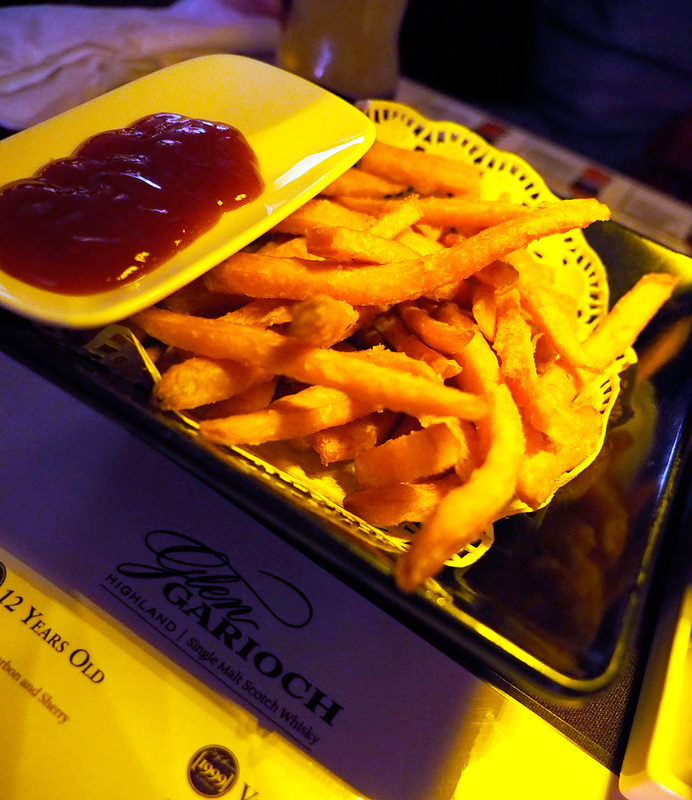 The black pepper sauce was nice, fries was crispy, nothing much we can complain here. 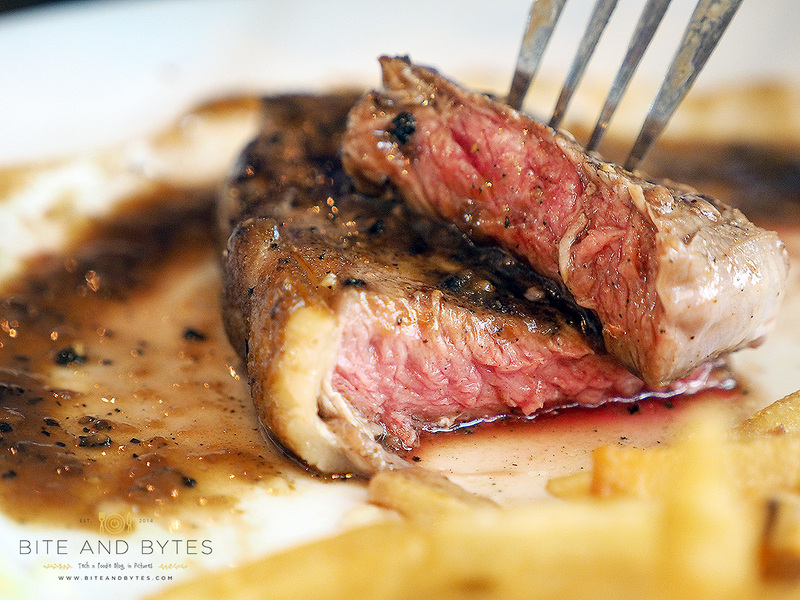 The most important point was it was cooked to the done-ness that was requested, as sometimes when you request for Medium-Rare, it usually comes Medium-Done. I don’t eat beef for religion reasons, but from the photo below, it should tell you everything. It was commented that the skin could have been seared for a longer time to be more crispy. And we ordered something else which had Chef’s recommendation again, after seeing so many people ordering this, a drink. Yuzu with Mint (S$4.00). 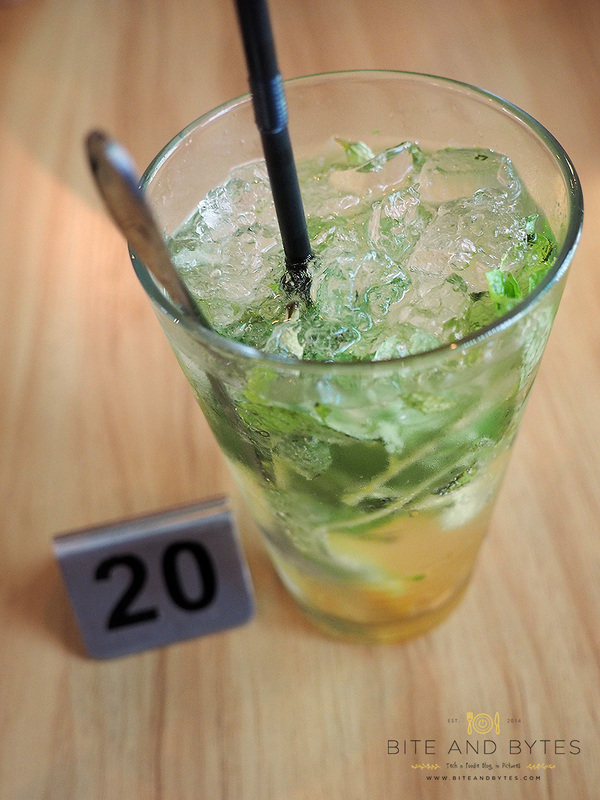 A really refreshing drink with the sweetness of yuzu and hint of mint taste. As you can see, they really give plenty of mint leaves, if you would like a minty taste, you should use the stainless steel spoon to crush the leaves more, though it’s also provided so you can scoop the yuzu bits at the bottom. So westies, would I recommend this cafe? Yeah, why not? 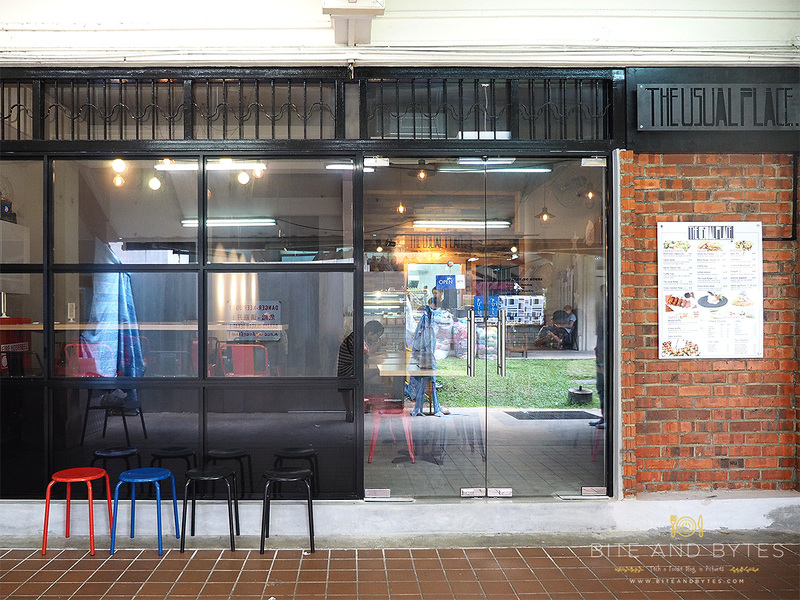 For the price, you do get a fair quality of food there, plus an ambience among the neighbourhood. Certainly worth a trip if you’re staying nearby. It’s quite near to Jurong West too actually, and a walk from Chinese Garden MRT station. Patbingsu has been christened as the Korean Ice Kachang by Singaporeans and I must say, that’s pretty damn accurate. It’s a combination of shaved ice, condensed milk, and toppings such as red bean, fruits, and nut powders. 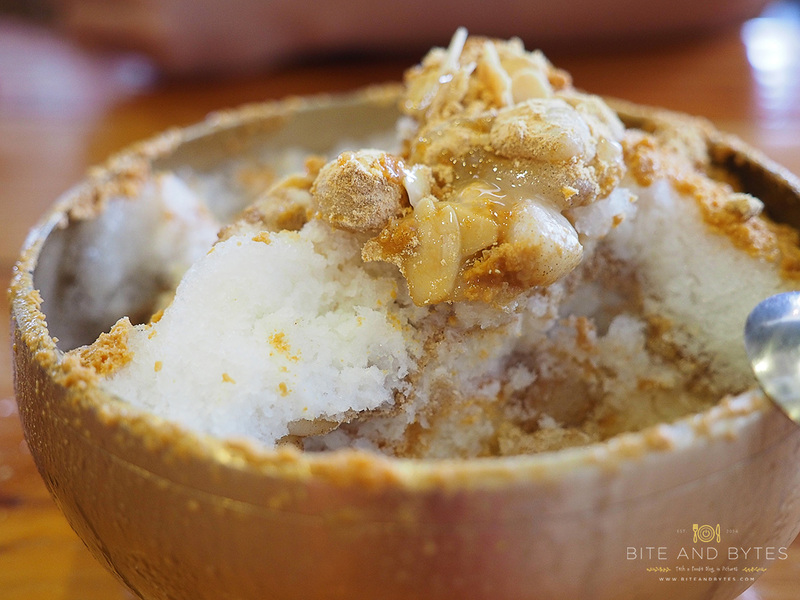 That sounds just about the right recipe for… our local ice kachang! Fun fact: According to Wikipedia, 팥 Pat refers to red bean! But of course, seeing how this was $11 (regrettably, sans ice cream), it is much, much better than our $1.80 hawker fare. THERE ARE RICE CAKES!!! I have a soft spot (pun intended) for all things with a chewy texture and this was no exception. 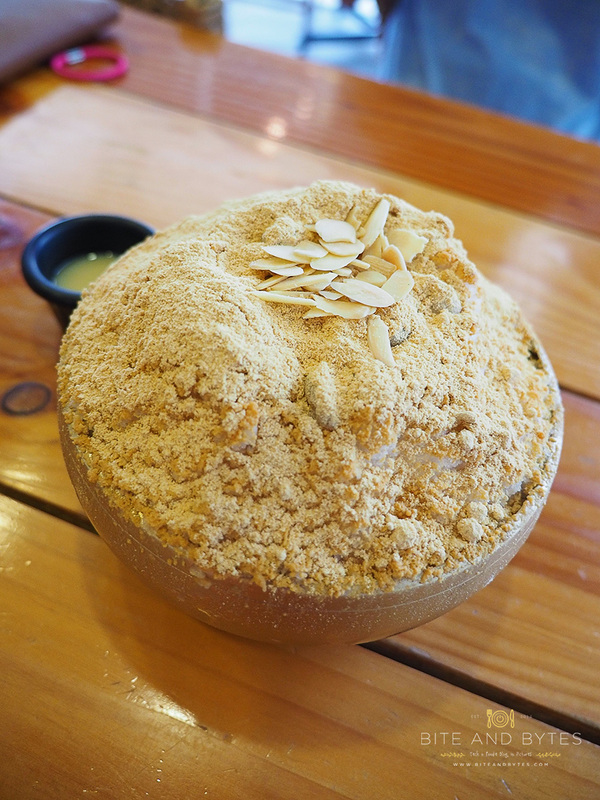 A savoury mass of rice cakes are embedded right in the middle of the bingsu, under that deceptively nondescript pile of peanut/soybean powder and slivered almonds. Just so you know where to look, because we only discovered them towards the end of our shaved ice. I was checking up on the kind of nut powder used, and some have mentioned that it’s soy bean powder. I’m not terribly sure as I thought the top coating was peanut, while the powder layered with the shaved ice was possibly soy bean. Help us solve the mystery and let us know what you think it is! 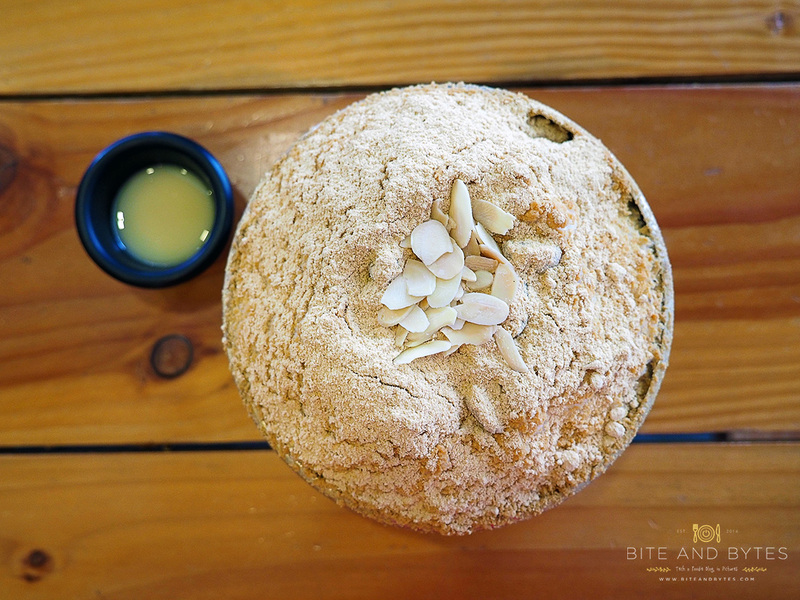 There’re actually many other Korean Bingsu cafes that have been popping up in the last couple of months, and we’re looking forward to hitting some of them soon. 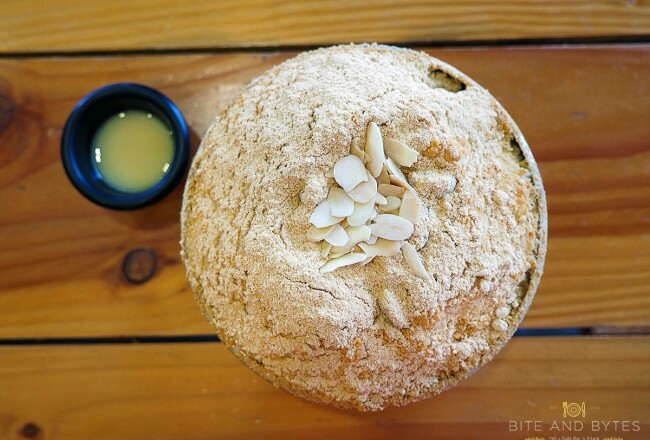 I would like to take this opportunity to highlight that… Bing Go Jung opens daily! That’s pretty rare for any F&B outlet and also very fortunate for us as we visited on a Monday, where most places have their off days. 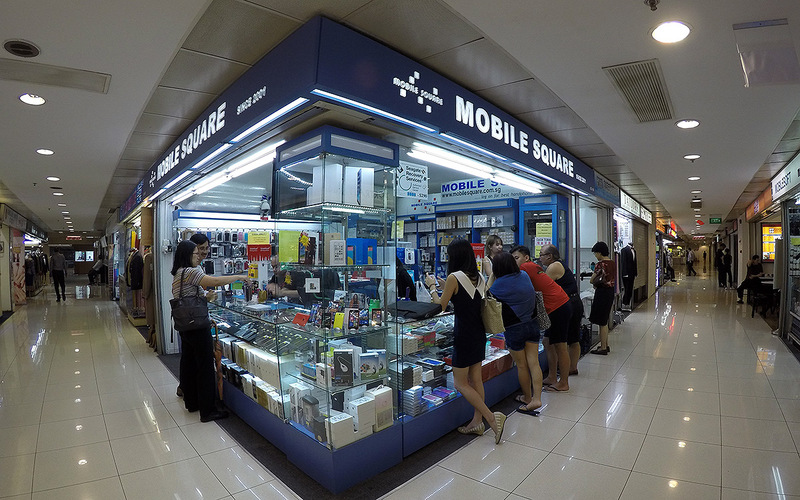 It’s good that probably there’s a buying guide on where to buy mobile phones safe from being cheated off your hard earned money in Singapore. 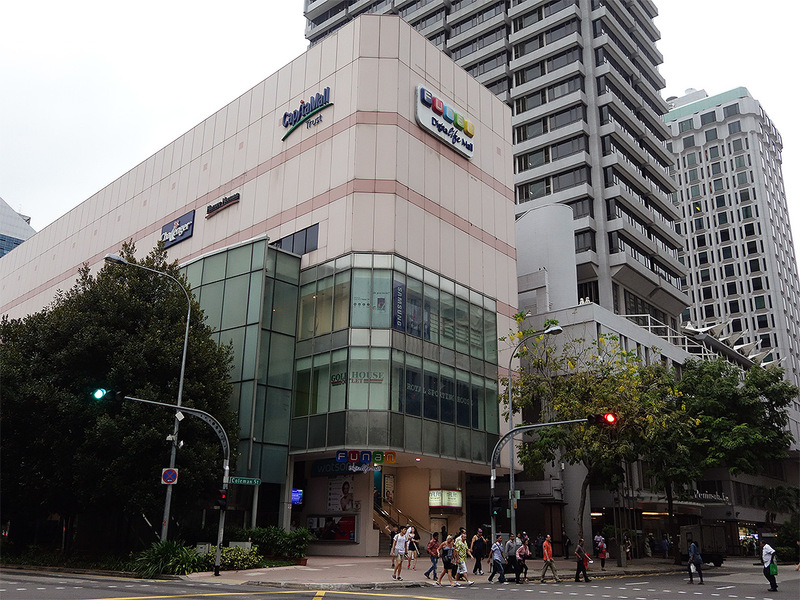 Although locals are usually well-informed of the popular retail shops through friends. But tourists, students and businessmen on trips may be unaware without proper research. However, there are still cases of locals being cheated of their money too, and usually they fall into the trap because of the lack of research. There are always price lists of electronics and mobile phones, so always rely on these to get a guide on roughly how much they cost. Hardwarezone Price Lists – Mainly for you to check on Computer systems, components, even microSD, SD, thumb drives price guide can be found here. 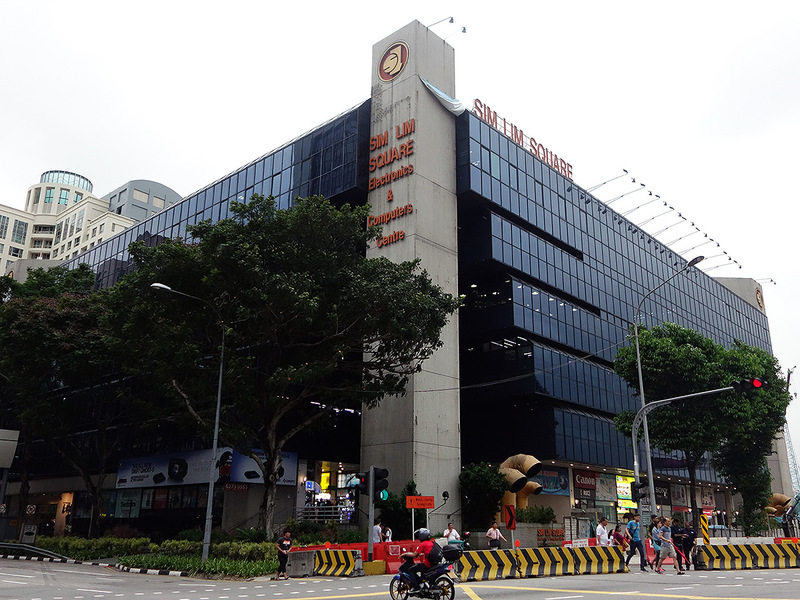 There are a lot of places in Singapore that people would recommend you where to buy stuffs, but do note that some places may not be as ‘safe’ as you think. Not good for almost everything, except shopping for perfume and having meals there. 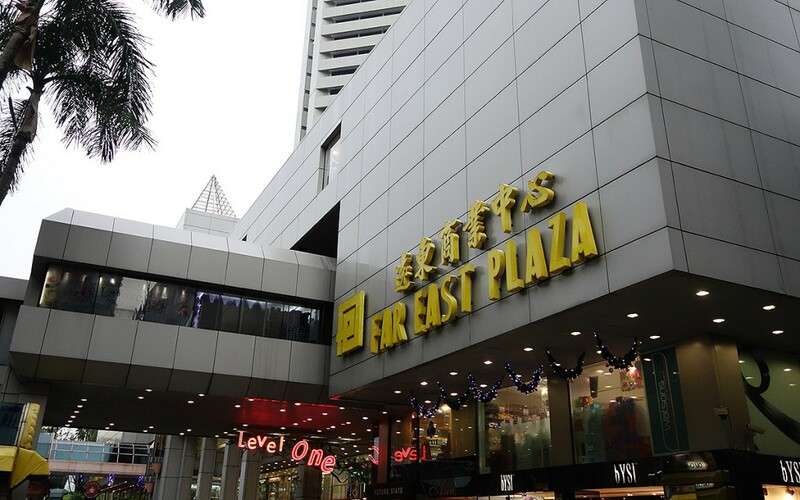 This place is almost safe to buy anything without being cheated, BUT always refer to point 1 – DO YOUR RESEARCH! 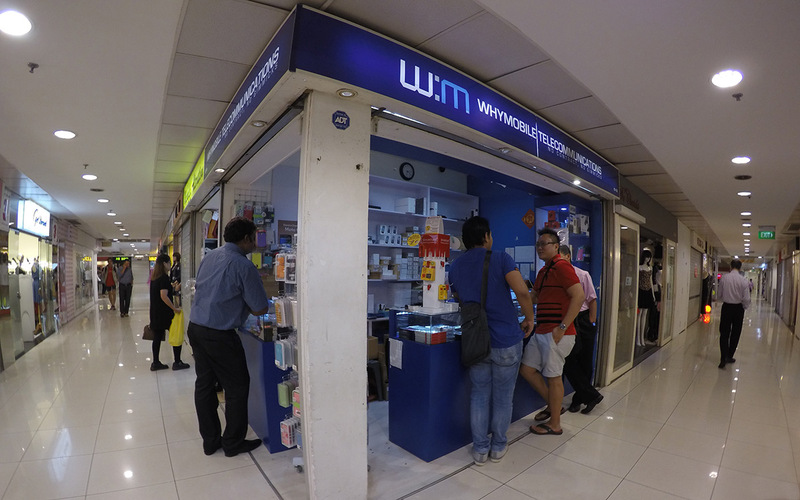 When you buy electronics and gadgets, always check for warranty with the salesperson. 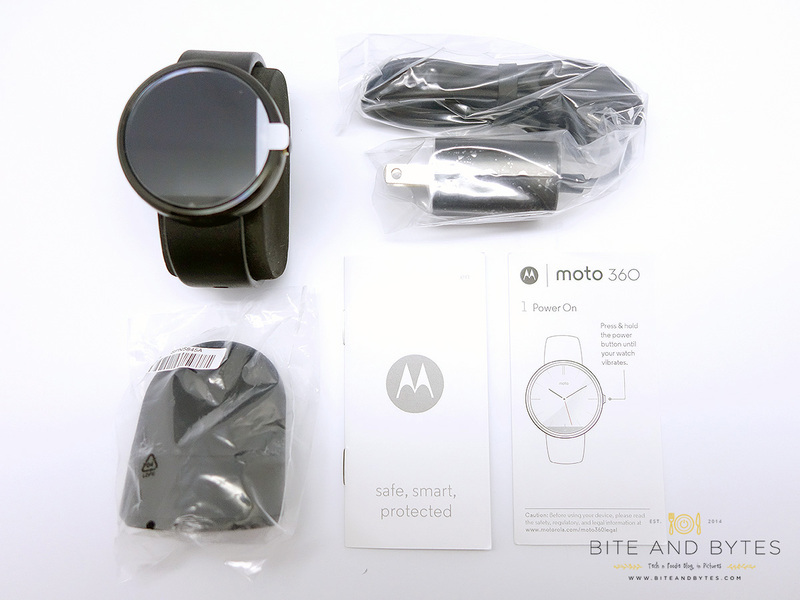 Check whether there’s international warranty, how many years, etc. 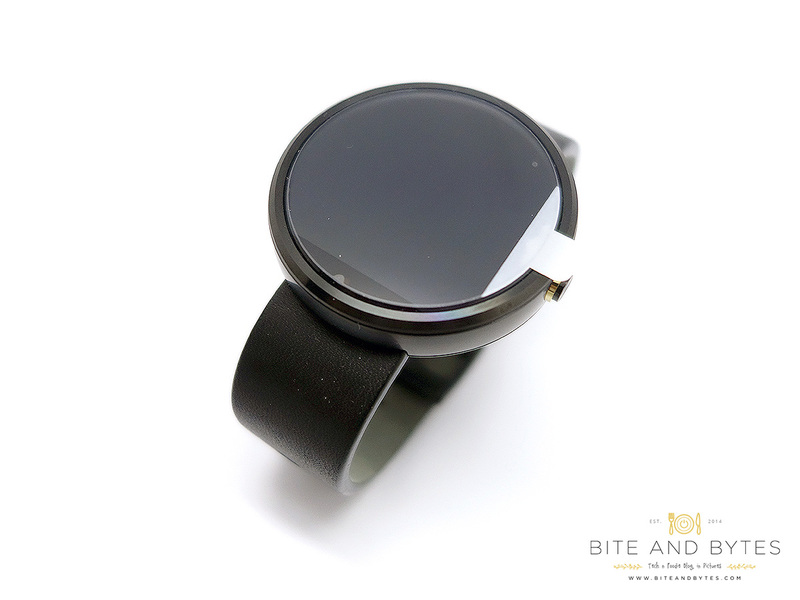 As a safer rule of thumb, unless you’re not bothered by warranty, avoid “Export Sets” as much as you can. Laptops usually come with international warranty, but always do a double check. Extended warranty sometimes are by the shop or through a 3rd party vendor, so always check whether the extended warranty you bought is actually valid overseas. AppleCare for MacBooks can be purchased usually with discount when you’re buying with a valid APR (Apple Premium Reseller), extends your laptop warranty for 2 more years. 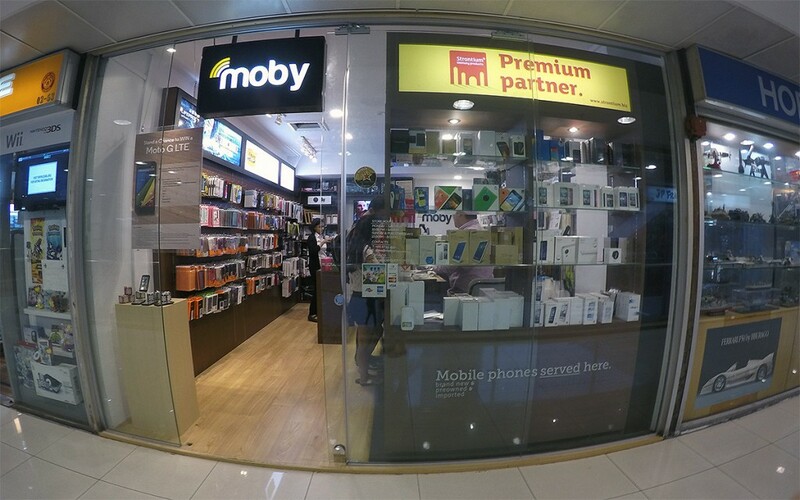 AppleCare for iPhones can be purchased from APRs (Apple Premium Resellers) like EpiCentre, Nubox, iStudio. 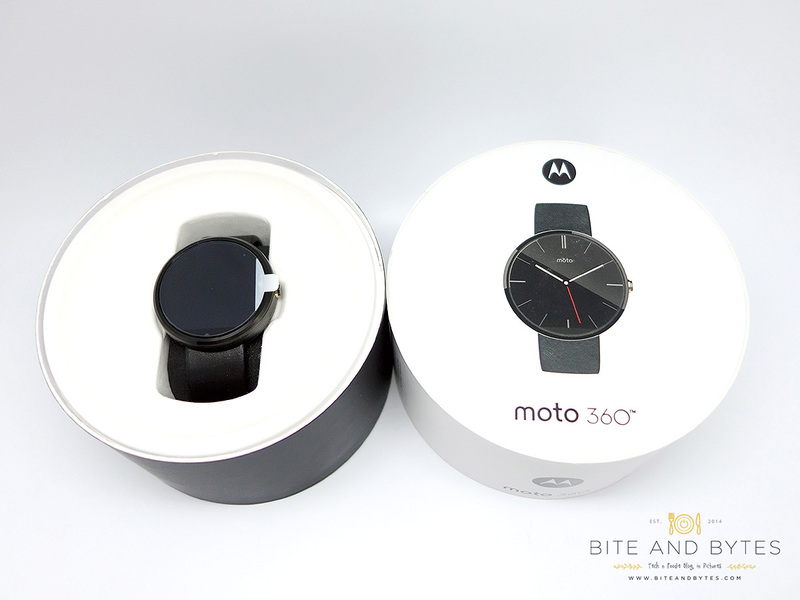 Retails for S$138 and extends 1 more year of warranty. With that being said, here are some of the recommended shops that you can go to as a safe guide. This is my personal list and there are of course other shops that offer good prices and customer service, leave comments below if you have other recommendations. Opening Hours: MON-SAT: 12.30PM – 9.30PM. Closed on Sundays. 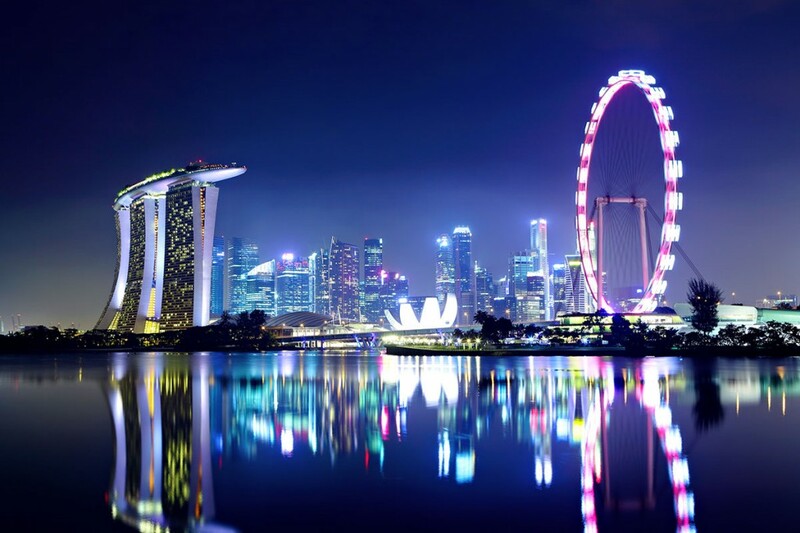 Hope this would be of useful help when you shop in Singapore for gadgets and mobile phones! And so, the craze is on! 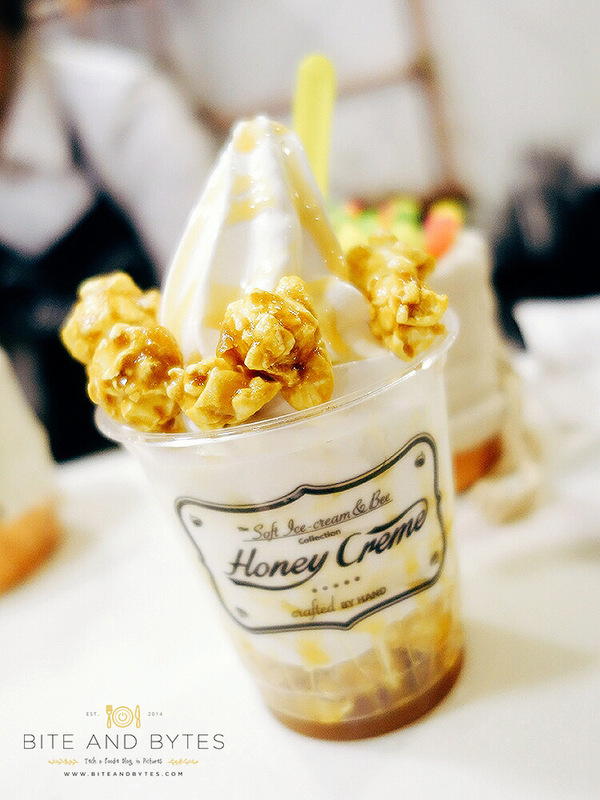 For some soft serve ice cream from Korea, called Honey Creme. 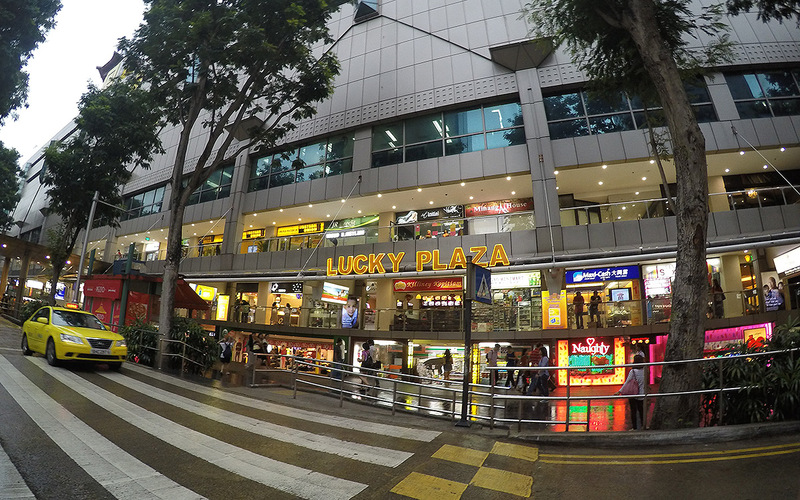 And they are now opened at 313 Somerset, but if you need directions to where is it, it’s located behind where the taxi stand is. I went there at about 5 plus and thought it would be soft of a ‘off peak’ hour, but the queue was still damn long! There must be at least 40-50 people before me and oh well, I thought how long could it take for an ice cream to be served? So I just gladly queued for it. For people who still think they are serving yoghurt, no they aren’t! They serve soft serve ice cream, something like what you get a McDonalds, but at a higher price of course… hehe, but of course taste wise it’s different too. Be prepared for a hot and sweaty queue outside as there’s no air conditioning, but they did place a rather big fan, but that would be blowing at you only when you get closer to the stall. 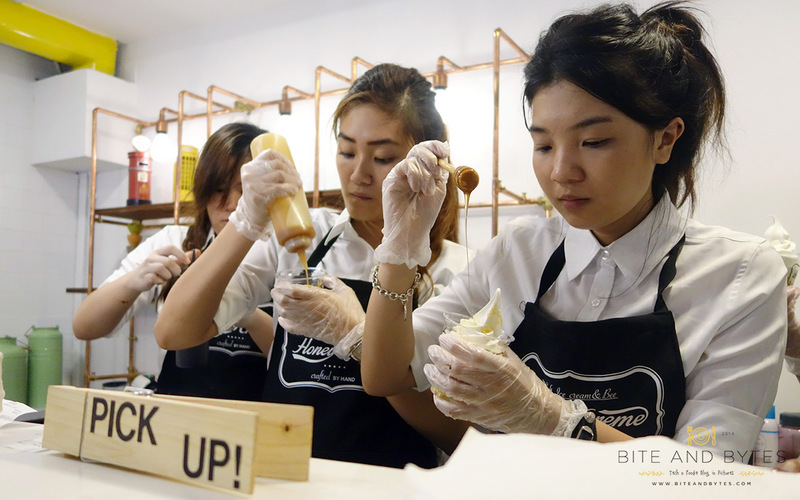 As you wait on, you will see the staff creating your own cup of handcrafted soft serve ice cream, which mostly has honey toppings unless you order the original plain one, which I wouldn’t suggest you doing so. Cause I felt the ice cream was good only because of the honey drizzled on top, or else just the soft serve alone, I would say I would prefer the Japanese type you get at Liang Court will triumph over them anytime. Just my personal view. Viola! 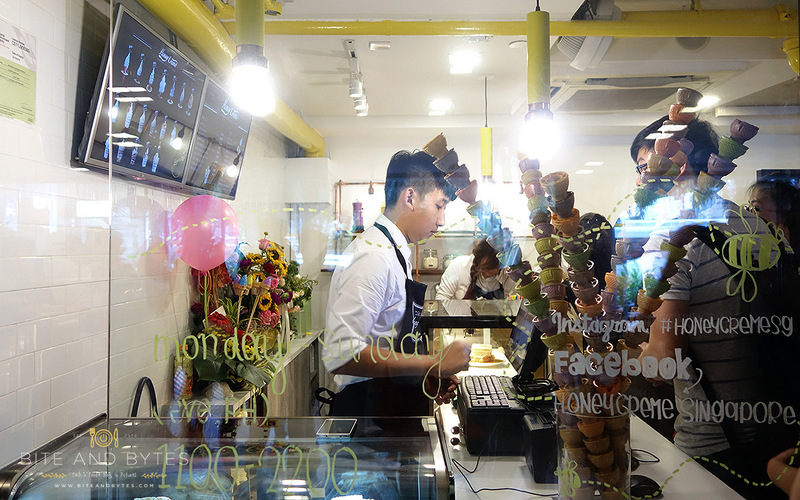 Your handcrafted ice cream! Most of the people in front of me ordered the same thing, Popcorn in a cup. This was refreshing, creamy and not too sweet, which was good in a way… People who don’t go for too sweet ice cream will love this. As I was saying, the honey makes it special, with that hint of caramelised taste that makes the ice cream sweeter too. The popcorn on the other hand gives that extra crunch and dimension to your palate. And of course, to queue so long and live up to the hype, everyone’s looking for a good instagram photo to this. This place apparently is a boutique hotel, a restaurant under The South Bridge Hotel. They serve food, crafted beer, and have a whisky bar filled with different types of Single Malt Whisky (inclusive of the Japanese type) too! The good news is, they are still running a 50% off food items on the menu (not sure why, they mentioned it’s like pre-opening special), oh well, as we were hungry for food and beer, we ordered 2 ‘main courses’. My love for eggs is undoubtedly strong, so I just ordered an omelette with Ham and Bacon ($14.90), after discount it’s only $7+?! The egg was fine, though I would have preferred it to be creamier or more fluffy? 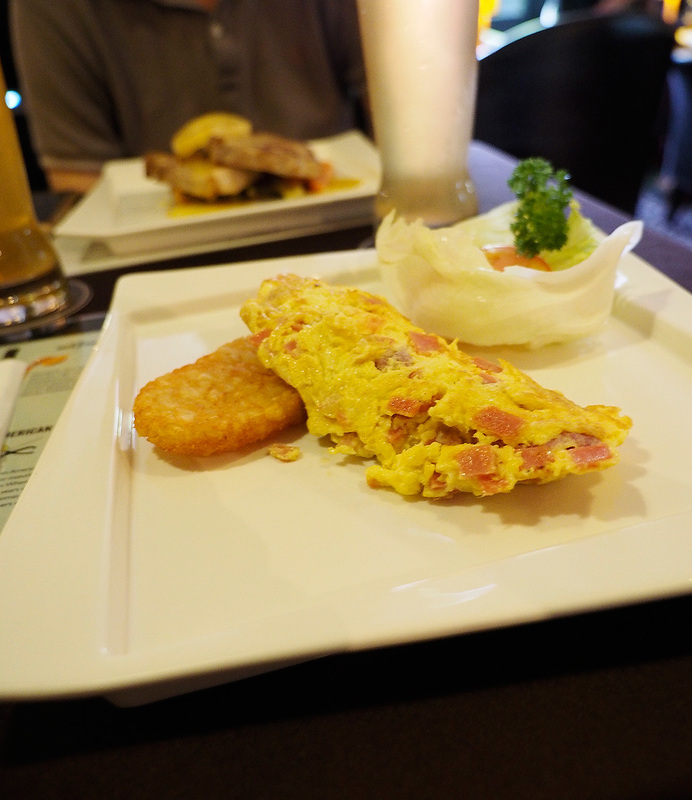 The ham and bacon complemented the omelette well to give that rich taste. 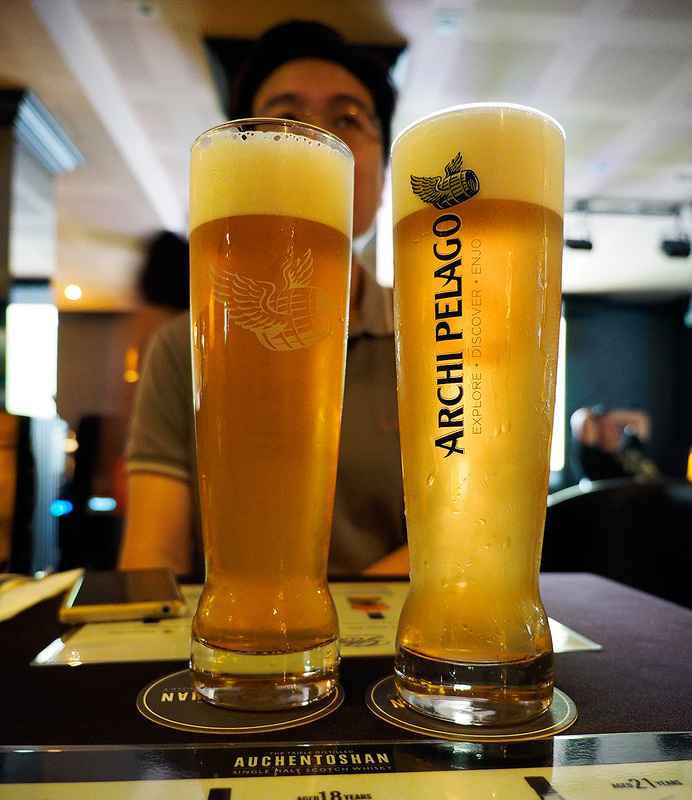 And not forgetting the main introduction to the beer they have – They have actually 5 different types of Archipelago Crafted Beer on draught. Namely 1) Summer Ale, 2) Bohemian Lager, 3) Belgian Wit, 4) Irish, 5) *A special limited edition*. The first one we tried was this Summer Ale, which had a refreshing grapefruit taste with a hint of bitterness to it. I liked this the best and it’s no wonder it’s one of their bestseller. The next 2 that we tried were the Bohemian Lager and Belgian Wit, the first one had a refreshing sweet passion fruit aroma to it, while the latter one has a crisp refreshing taste of orange & coriander. 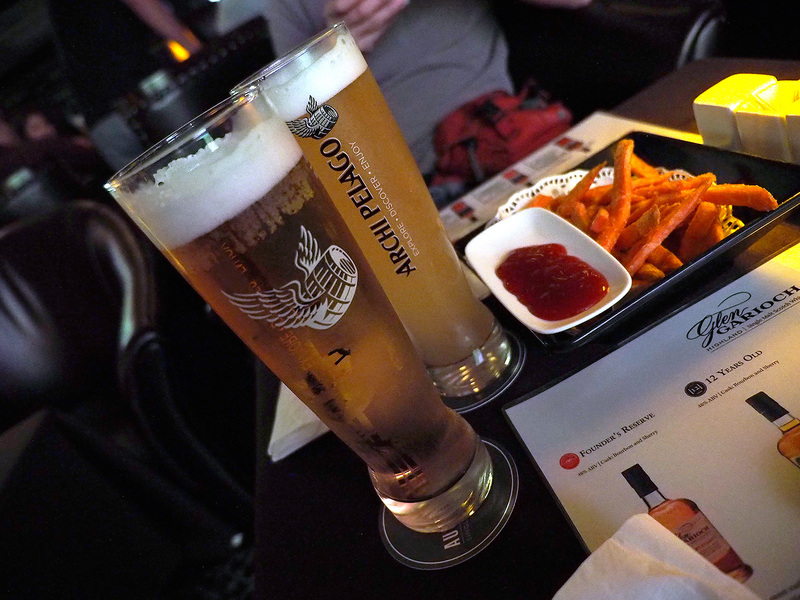 Both were good, but if you had only one more pint to go for, I would recommend the Bohemian Lager as the taste would be more special, I just felt Belgian Wit is like plain Heineken beer or something… hehe. Their draught beer will cost you about S$10 a pint by the way, which I think it’s very affordable, and it’s the same price all day, even on weekends. Oh yah, you might be asking what about the Irish one and the special edition, my boyfriend tried the Irish one in the past and didn’t fancy it too much, as it had the ‘coffee powdery’ taste to it, he could barely finish it… hehe. As for the special edition, we didn’t have a chance to try as we were rather full by all the food. Do leave a comment if you had tried them! We had to have a few bites to go with the beer, so decided on sweet potato fries ($10.80 before discount) over normal fries (which also costs the same). This was my first time having sweet potato fries and they were crisp, crunchy and sweet! So is this really healthier than the potato version? Not sure, but it certainly tastes better to me, though with sweet chilli sauce wasn’t the best combination. 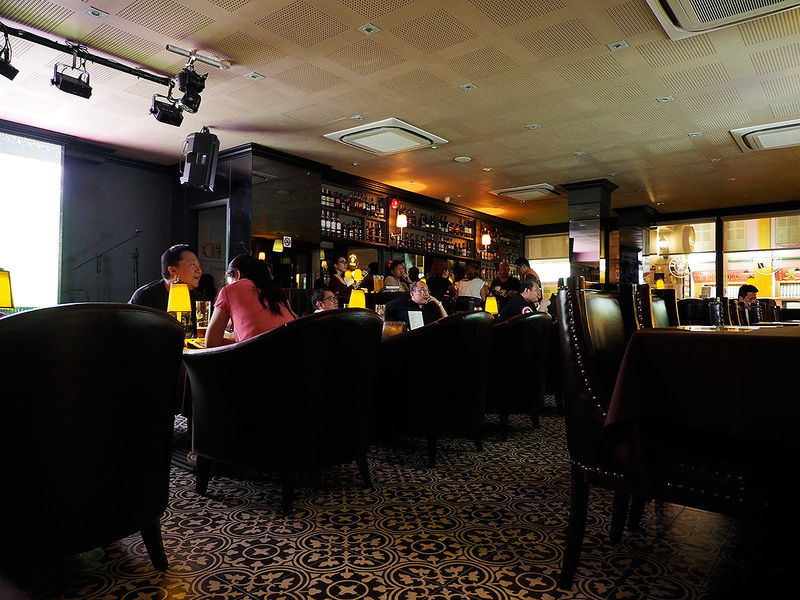 This place is sure cozy and comfortable, the seats they have are so ‘atas’ looking, what you’re seeing above is their Whisky Bar by the way. They also broadcast Barclays Premier League matches live when we were there, so it’s really a good place to chill out and catch your favourite matches! However, do note that they are quite full on peak hours usually, with live band performing. It’s unclear why on that night we went, it was rather empty with only 50-60% seats occupied. 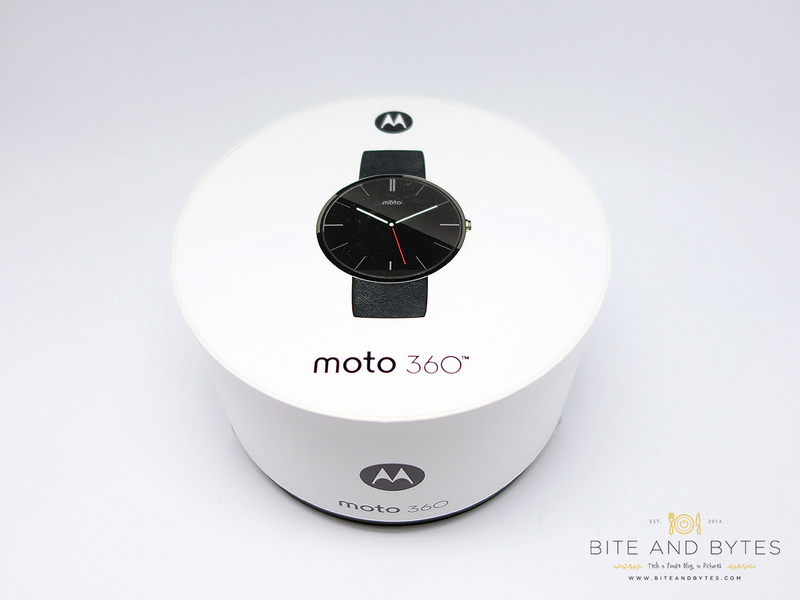 Finally managed to get hold on Motorola’s Moto360! 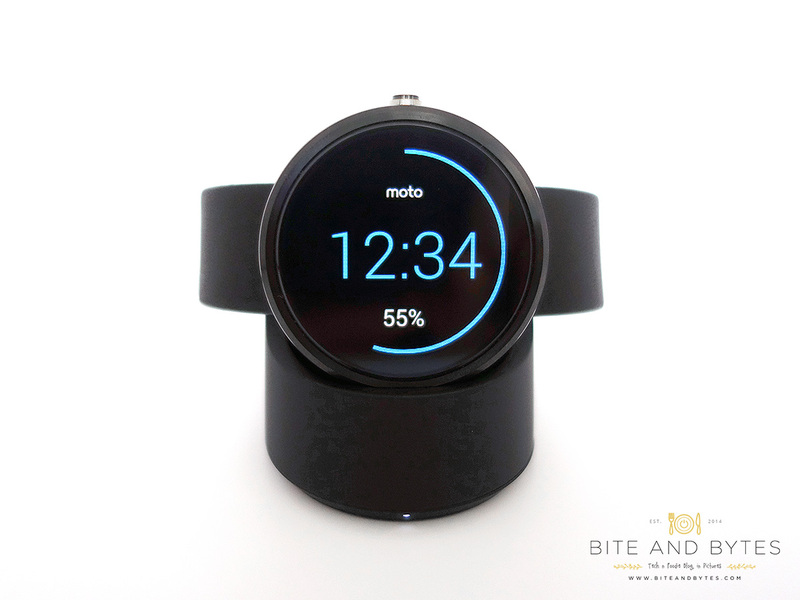 This is like the holy grail of all smartwatches now, and it took me so many attempts to get it! Lastly, using Comgateway BuyForMe service and finally got through! 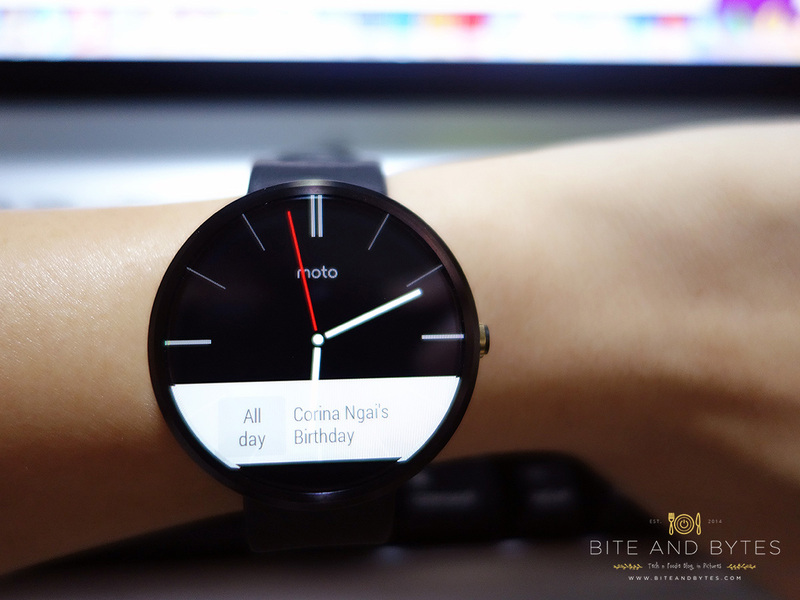 More in depth review after real usage on the watch, though still waiting for screen protector to come!